High gloss kitchens are one of the most popular styles in homes throughout the UK. And for good reason; they look great, are durable and easy to maintain. Plus, the range of options when it comes to high gloss kitchens is huge so there's something to suit every taste and budget. What are High Gloss Kitchens? When people talk about high gloss kitchens, they are usually referring to the finish of the doors, drawer fronts and visible cabinet exterior surfaces. As their name suggests, these kitchens are made with a smooth glossy finish that is highly reflective. The surface helps to reflect light around a room, making them great for anyone wanting to achieve a spacious, airy and contemporary look. High gloss kitchens are incredibly versatile and can be configured in any number of ways. A kitchen completely finished in gloss looks superb and provides a very clean and streamlined look, particularly in white or neutral shades. Gloss finishes can be used in combinations of colours to add interest and also look fantastic paired with wood, bringing an extra tactile dimension to the space. There are several ways that high gloss kitchens are manufactured, each produced using different materials and methods. The most common are wrapped, lacquered and acrylic. When selecting between the different options, important things to consider are your budget and the colour or style you'd like to achieve. 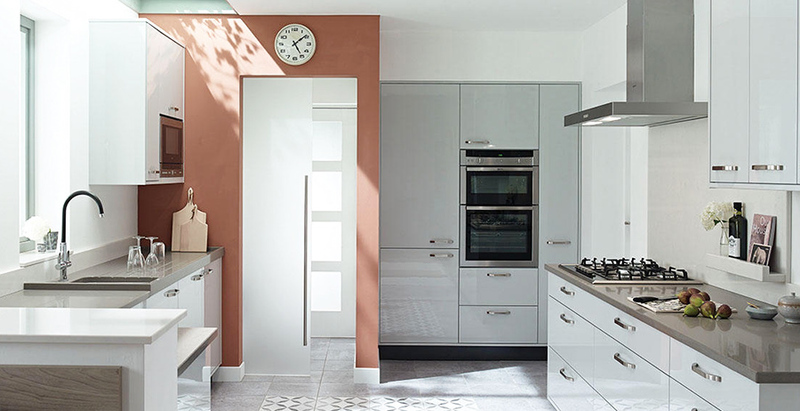 Buying from a good supplier ensures you will be getting superior quality products and so your choice may ultimately be down to personal preference rather than inherent differences in the way kitchens are made, as all should be durable and offer a high quality finish. Your kitchen designer will also be able to make recommendations based on what you are looking to achieve with your kitchen. 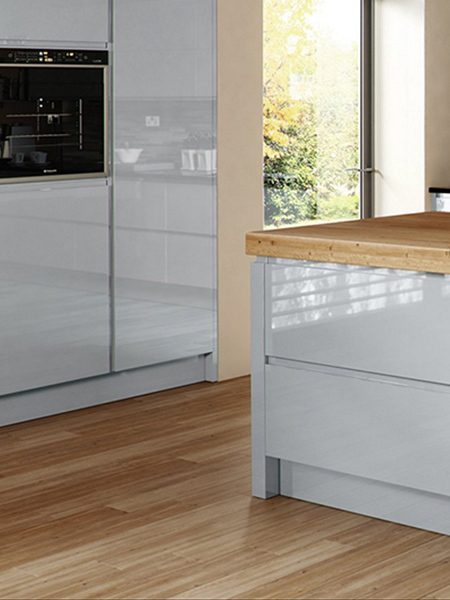 Lacquered gloss kitchens are created by applying several layers of high quality paint or lacquer to an MDF core. They offer an incredibly smooth finish and are considered to be one of the higher quality options. best suited to domestic installations. Made by laminating an MDF core with a wrap of PVC or vinyl, wrapped kitchens are possibly the most widely available type of gloss kitchens. They are a great budget friendly option however sometimes aren't quite as smooth as other types of gloss kitchens on close inspection. The quality of gloss kitchens made using this production method can vary, with some manufacturers using a thicker gloss layer than others to achieve a superior quality finish. 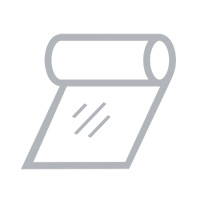 If you are thinking about opting for this style, it is a good idea to compare the quality of the doors at a kitchen specialist as it is usually possible to get a higher quality product than you will find at most chain suppliers for a similar cost. 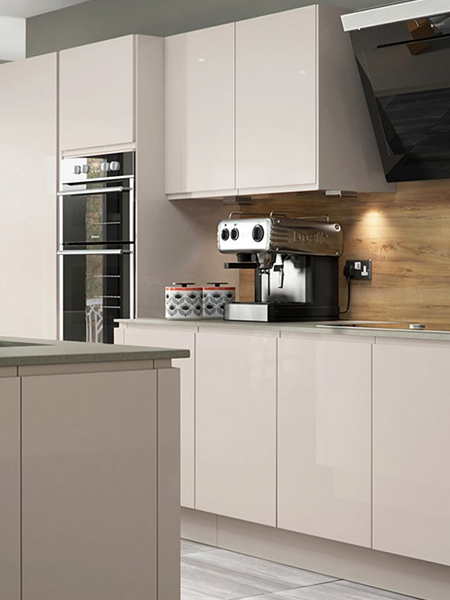 Wrapped gloss kitchens are cost effective, durable and easy to maintain. nature of acrylic means that unlike wrapped or painted kitchens, the gloss finish will not translate to the door or drawer edges so these will either be matt or there will be a break in the finish between edges. However acrylic kitchens are usually very durable. Are High Gloss Kitchens Easy to Keep Clean? their best. Most everyday food and drinks spillages can easily be cleaned up by simply wiping with a damp cloth. to remove any excess water drops is usually all that is required to keep gloss kitchens looking like new. If you want to clean more thoroughly, soapy water or most household cleaners will be suitable. Kitchens need to be hard wearing and high gloss kitchens are one of the most durable types available. A good quality high gloss kitchen can easily handle the bumps and scrapes of everyday life. With a little care, your kitchen will stay looking like new for years. Are High Gloss Kitchens Cheap or Expensive? High gloss kitchens look stunning, but that doesn't mean opting for this style needs to break the bank. The range of options available means there is something to suit every budget, whether you want a cheap high gloss kitchen or are planning on spending a bit more. As with all new kitchens, setting a budget early in the project is important and allows you to filter the available options. 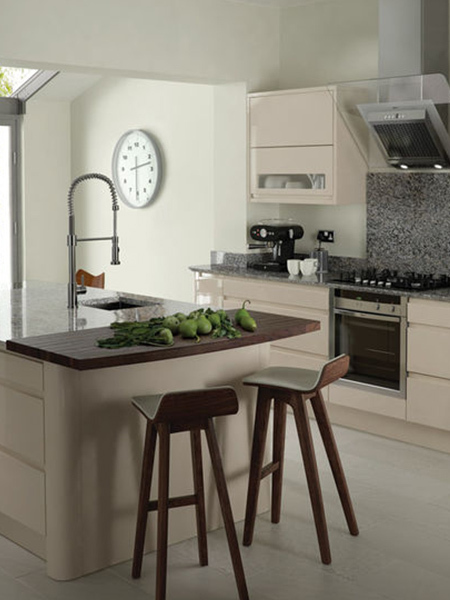 There are lots of fantastic budget high gloss kitchens available that offer great quality and looks. 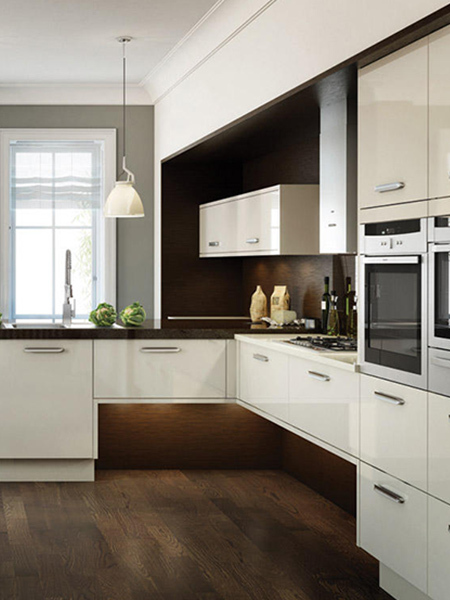 Equally, if you want a luxury high-end gloss kitchen there are many stunning choices. Laminate or wrapped gloss kitchens are usually the most budget friendly option, with glass or acrylic kitchens being at the higher end of the price spectrum and lacquered kitchens sitting somewhere between. Would a High Gloss Kitchen Suit My Home? High gloss kitchens look great in a wide range of homes. One of the things people like best about gloss kitchens is their versatility and ability to integrate with almost any interior design scheme. For contemporary homes, high gloss kitchens are an obvious choice. Their smooth, clean lines and reflective qualities mean they fit seamlessly with modern dÃ©cor. High gloss kitchens also look great in traditional homes as well. 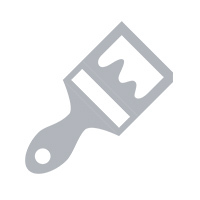 Whether used in combination with other finishes such as wood, or on their own. and subtle paler shades to deep rich colours and vibrant tones. you what your new kitchen will look like once complete. 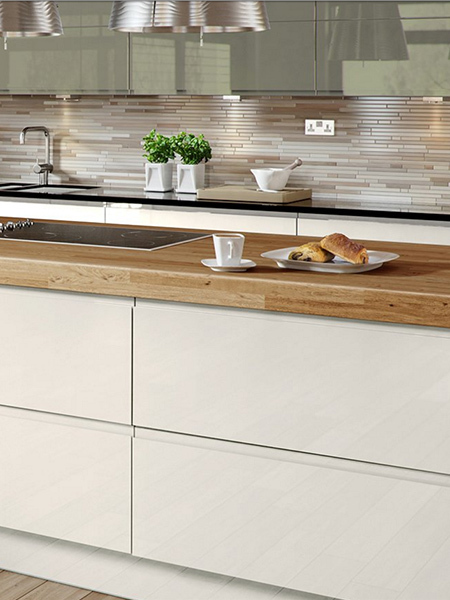 To browse high gloss kitchens from leading manufacturers, take a look at our range. 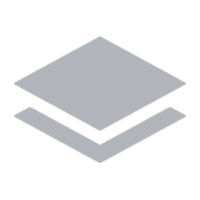 If you have any questions or would like to speak to our friendly team about a kitchen project you're planning, call us on 01242 523 879 or use our online contact form. For more ideas, take a look at our high gloss kitchen inspiration page.